Quick Pic - Wise Words found in the Clutter! Wise Words found in the Clutter! Yesterday started out like many days, with a cup of coffee and a peek at the sunrise. But without warning, it suddenly turned into a Major Day of Reorganizing our Stuff. How that happened, I’m not entirely sure! We’ve been losing a lot of things lately — a magic marker we just bought, a UV filter for one of our camera lenses, a magnifying glass. None of it is mission critical, but it was getting on Mark’s nerves, because he’s not a person who loses stuff. That’s my job! I always thought I was orderly, but in our little household he is the tidy one, the one who knows where things are and who keeps us on track as we navigate our way through life. I’m the one who knows how to sweet talk the computers when they get cranky, who gets the paperwork done, and who makes those nasty but necessary phone calls where you’re put on hold forever. So, when he suddenly started opening all the cabinets and flashing things in my direction saying, “Do you want to keep this?” as he placed it in a growing trash heap in the middle of the floor, I knew I’d better snap to attention and join the party, or he’d get to the back of the cabinets before I had a chance to know what had once been in them. As the papers flew, and the boxes of miscellaneous stuff got emptied, and the properly sorted goodies found new homes in new places, Mark suddenly stopped. He had a funny smile on his face as he held out a little slip of paper in his hand. Oh my. How true that is. We feel so lucky to have found a way of life that makes us truly happy, and we say that to each other every day. For everyone reading this — if you are dreaming of a life of travel, or you have other dreams you hold close to your heart, be bold, conquer your fears and take the steps to make it happen! It is so worthwhile in the end. Our buggy is now better organized than it has been in years. Three lawn bags full of clutter left this tiny home! We never did find those missing items, but John Irving’s wise words of wisdom have found a place on our wall! 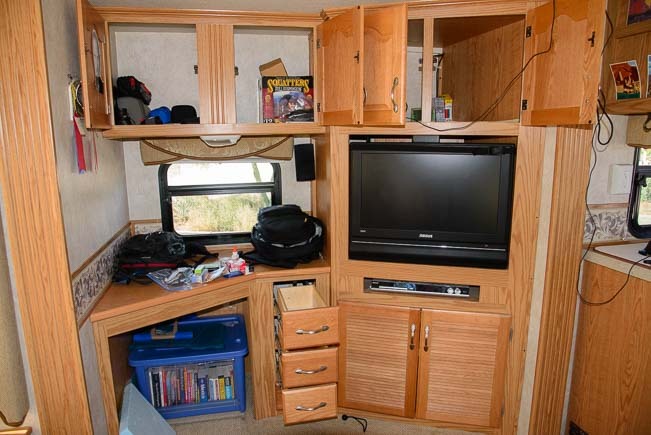 If you need some pointers for getting organized, our full-time RVing friend Donna Smallin Kuper is a best-selling author of books on decluttering, and she has oodles of organizing tips at her website! 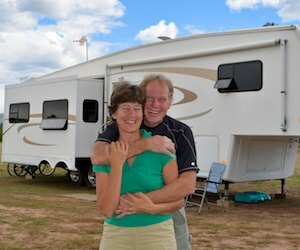 Her hubby Mike blogs about their life on the road at Flying the Koop.